5 Minutes with Grant Lichtman: Is Your School’s Engine Defunct? The traditional independent school model is under threat. The case for clearly defining, differentiating and delivering a very different value proposition. Grant Lichtman is a former business officer and an internationally recognized thought leader on the transformation of K–12 education. A widely published writer and a popular speaker and facilitator (including at many NBOA events), he is the author of three books, including “Moving the Rock: Seven Levers We Can Press to Transform Education” and “#EdJourney: A Roadmap for the Future of Education.” He spent almost 15 years as a senior administrator and trustee at the Francis Parker School in San Diego. 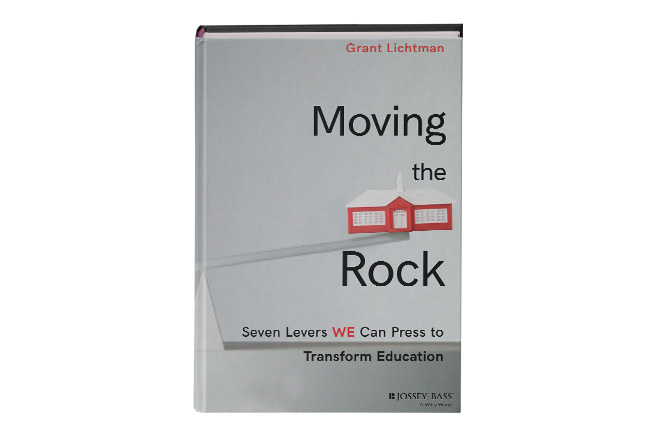 Feature image: Lichtman's newest book describes seven nontraditional "levers" schools must push to prepare for the future. Net Assets: You’ve been talking for some time about the sweeping systemic challenges facing independent schools. What do they boil down to? Grant Lichtman: Well, let’s first get beyond the words “financial sustainability.” By now, I believe that financial sustainability has become like the water in the fish tank. It’s just the environment we’re swimming in. By now, I believe that financial sustainability has become like the water in the fish tank. It’s just the environment we’re swimming in. Going deeper, I think two changes have happened across virtually all sectors of the economy. One is the reversal in relationships between producers and consumers. For decades, large producers of goods and services said to the consumer, “This is what is available and what we want you to buy.” We all bought it. Today, consumers say, “This is what I want, where I want it, when I want it. And if you don’t produce that for me, I’m not going to buy it.” This reversal applies to virtually all sectors including education, which has been largely immune from industry-wide competitive pressures for most of the last century and a half. The result is that families have a wildly differentiated set of options that didn't exist even a decade ago, and many of those options come at much lower tuition points, or even for no tuition at all. The second fundamental change is demographics: In many markets, both public and private schools are competing for fewer students due to lower birth rates. Net Assets: You’ve used an interesting metaphor to poke at the fundamental problem: “You can shovel as much coal as you can, as fast as you can, into a steam engine, but the train or ship will not go any faster.” What does this mean for independent schools? Lichtman: It doesn’t matter how fast you shovel coal into that boiler if you stick with the same coal-fired engine you’ve always had. The train or ship will still only go a certain speed. Oil power, and later nuclear power, were disruptive innovations to the transportation system. The same problem applies to schools that stick with the same basic model they’ve always used. There are limits to how much more efficiently and effectively you can operate the system, and how much more attractive you can be to customers. To that point, it’s critical to understand the pressures that student-to-teacher ratios put on independent schools. Unless a school has enormous financial resources, we have reached or gone past the point where we can get better learning outcomes by reducing class sizes. This opens the door for innovators to develop a new “engine” that can generate equal or better outcomes with larger student-to-teacher ratios. This does not mean just buffing up the chrome on the wheels or cleaning the soot from the smokestacks. My sense is that some of the most innovative schools are in the public and charter sectors. I’m seeing public schools, which operate with all the traditional burdens of the public sector, offering the kinds of tremendously innovative and successful learning experiences that families are asking for. If one of these schools were to plop down across the street from a successful independent school, I can see that independent school going out of business almost overnight. Net Assets: Can you share some examples of independent schools that are aggressively innovating now, that are fundamentally replacing their engines? Lichtman: There are so many, and I’ll share some examples. But what I would strongly suggest — and I think this is critical — is for independent schools not to look to other independent schools for what's possible. Independent school folks have got to get the heck out of that silo. Having said that, here’s some of what I’ve seen. In Atlanta, Mount Vernon Presbyterian is all about design, innovation and impact. Everything they do, from preschool through high school, has a real flavor of moving in those directions and giving students the opportunities to operate in that kind of learning environment. The Tilton School (New Hampshire) wants students to pursue their personalized learning pathways through their four years in high school. They looked at everything from student assessment to adult professional growth to curriculum and pedagogy to campus life, because they're a boarding school program. Another example is Saint Andrew's Episcopal School (Maryland), which has doubled-down on cognitive neuroscience in education. With their Center for Transformative Teaching and Learning, they’ve committed to incorporating what they’ve learned about how the brain works into their curriculum. That’s a big differentiator, in a very, very competitive market. In fact, they got a million dollars from the Chan Zuckerberg Initiative to go global with this work. Net Assets: What’s interesting is that these are all established schools with long histories. Yet they’re not letting their legacies or histories hold them back from making big changes. Lichtman: Here’s the dilemma. We can lose the future if we forget the past, but we can’t win the future with the past as our guide. The last thing you want a school to do is lose its legacy strengths. But if you’re constrained by them, you can’t win the future. This is where existing schools are going to struggle, because they have legitimate and important traditions that they don’t want to lose. But they have to let go of some of them. And that’s going to lead to some uncomfortable choices. One of my longstanding mantras, ever since I took my EdJourney [a road trip visiting 64 schools] in 2012, is that changing schools is not hard, relative to the real hard things in life. It’s uncomfortable. Schools that are willing to embrace that discomfort ask themselves, “What can we let go? What do we have to let go?” Those are the schools that will evolve successfully. Net Assets: You have said, "The future lies in clearly defining, differentiating and delivering a different value proposition." What steps can schools take to have these discussions? Net Assets: It sounds daunting for a school community to agree on its best version of its future self. Your value proposition is the difference between what you say you’re going to do — that aspirational vision — and what you actually deliver, as viewed through the eyes of your customer. This discussion can be fully unwrapped by a large, diverse group of school stakeholders in as little as a few hours, assuming the school is ready. It doesn’t take long at all if you bring the entire school community together and ask them to articulate what makes them a uniquely powerful educational institution. The time-consuming part involves translating those aspirations into things that will happen every day in the classroom. And ensuring that those things are supported appropriately by the institution. Because then you have to deliver on the promise. That’s the challenge facing any organization in a competitive environment. Your value proposition is the difference between what you say you’re going to do — that aspirational vision — and what you actually deliver, as viewed through the eyes of your customer. The greater the consistency between those two, the more your value proposition goes up. The less consistency there is, the more your value proposition fails. I’ve said for years that schools basically operate at three different levels. The 30,000-foot level is the aspirational level. The 10,000-foot level is this operating system — the engine, to use our metaphor. And the ground floor is what the school does every day with students. When those three align, you deliver a consistent value proposition. When they’re not aligned, you don’t. An example of the latter might be a high school that says it believes in personalized learning and helping students be critical thinkers. But its schedule is structured around AP courses, which are not individualized or personalized and are often not heavily focused on critical thinking. Then you have a fundamental disconnect between the school’s aspirations and its operating systems. Net Assets: Finally, you have encouraged business officers and other school leaders to keep asking themselves a single question: "What is the job we've been hired to do?" Lichtman: That comes from the jobs-to-be-done model, which Clayton Christensen and others have been adopting in their work for a decade or so. It refers to a way for organizations and businesses to think differently about creating that irresistibility that Seth Godin talked about. Many independent schools get it wrong, I think, when they when they assume they know the answer to this question: “What is the job that we as a school have been hired to do?” NAIS data from a decade ago showed that there were two overwhelming reasons that parents chose independent schools: “My child is known, and my child is safe,” at least compared to public schools. All independent schools should be asking themselves that question: “What is the job we’ve been hired to do?” And if they don’t know the answer, or they can’t agree on it, that’s a pretty compelling reason to engage with their communities to find those answers that should be driving long-term strategies.